With tidally induced synchronicity, the Moon exposes the same face to observers on Earth. The face we see is called the Near Side. The Far Side is never visible to observers on Earth. The Near Side of the sunlit full moon is observable from earth every 29.5 days. The full moon reveals dark areas (lunar maria) corresponding to basaltic plains and lighter areas corresponding to highlands. Over the ages humans have recognized pareidolic visages of human faces, heads or bodies. The familiar face of the moon has evoked various Man in the Moon mythologies. Illustrations in western art often depict a simple smiling face in the full moon or a caricatured human profile in the crescent moon. The Moon exposes the same face on Earth because of a phenomenon interchangeably called tidal locking, gravitational locking, or captured rotation. Tidal forces on Earth have slowed the rotation of the Moon so that Earth and the Moon have synchronous rotations. Specifically the Moon makes a full rotation about its axis in about the same time it orbits Earth (depicted below on the left). If the Moon had no rotation (depicted above on the right), it would expose its near and far sides to observers on Earth while orbiting Earth. The Soviet satellite Luna 3 showed us the first image of the far side of the Moon in 1959. The far side has been recorded by various spacecraft over the years including most recently by the DSCOVR spacecraft. 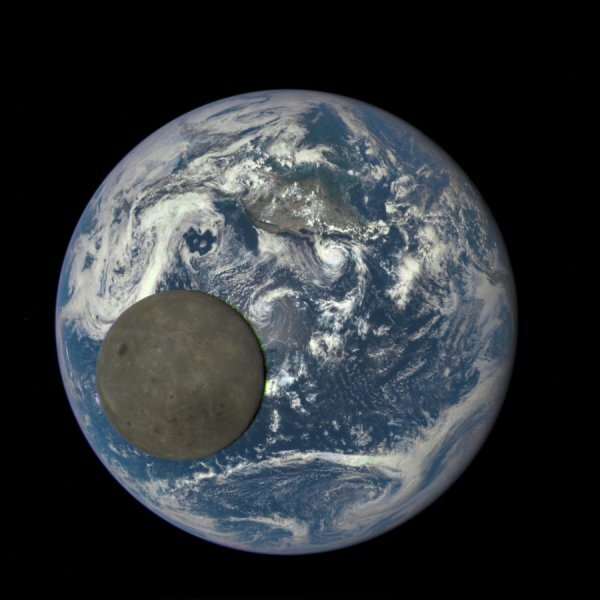 The DSCOVR image below shows the far side of the Moon as it orbits over the Pacific Ocean near the North American continent. Far side of the Moon, Wikipedia. From a million miles away, NASA camera shows moon crossing face of Earth, Science Daily, 5 August 2015. Man in the Moon, Wikipedia. Soviet Moon Images, Don P. Mitchell, 2003.